It's here. Well, it's almost here. Or it is here. Or it's already done. That Harry Potter marathon I promised. Expect a full write-up in a few days. 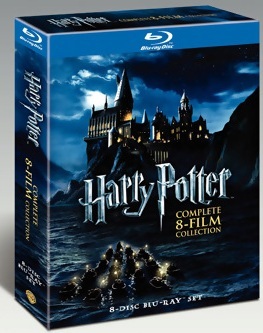 I'm sure I'll need some time to recover--that's 19 hours and 38 minutes of continuous wizarding! Are you watching all the Harry Potter movies just to do it, or is there a reason you're watching all the Harry Potter movies specifically? I'm actually toying with the idea of having a Planet of the Apes marathon sometime soon. APN: Just to do it, really. It's been a while since I've done a marathon, and because of how long it's taken to make these movies, I think it'd be a neat experience to see how things change in what (for me) is such a short period of time. Planet of the Apes sounds like fun, and with fewer movies to watch, you can probably afford, like, TWO minutes of break between films instead of just one. The only caution is that there's a bigger potential for falling asleep than usual--I distinctly remember the first movie feeling like it dragged a bit simply because there was so much silence, and I recall a bit of recapping/repetition in movies 4 and 5. Still, sounds like fun. I've read the books, but I stopped watching the films since The Half-Blood Prince. I just wasn't content with the growing mass of screaming teenage girls who very nearly killed one of my favourite book franchises, and I got annoyed with all of the hype. Sure, seeing an adaption of a good book is [usually] a good thing, but I honestly couldn't care less about Daniel Radcliffe having a picture of his unshaven face in the newspaper. 'Just makes me wanna punch some obsessive fans, I guess. Yeah, some of the Planet of the Apes movies did drag on a bit. In fact, while I've sat through all five of the original movies, I believe I did fall asleep in a few spots (but that might also be because it was late when I watched a couple of them. Perhaps if I invite some friends to the marathon it might help me stay up. :D I kind of got the idea from watching The Big Bang Theory. On an episode where Sheldon got sick, Leonard, Raj, and Howard discovered there was a Planet of the Apes marathon at a local movie theater. Actually, that brings up a question. Do you watch The Big Bang Theory, and if so, what do you think of it? I love the show, but other geek friends of mine hate it. I was pointed to a website on-line that had an article of why geeks hate The Big Bang Theory, and then an article from the same website on why geeks love The Big Bang Theory. What are your thoughts on it? APN: Friends definitely help! I'd be interested to see the articles you mentioned; I myself don't watch TV all that much to begin with, but I've seen bits and pieces of the show. It's funny enough, but I find I'm generally resistant to the celebration of geek culture as something completely mainstream--despite the clever references that only geeks would get, the whole show feels a little cheaper because it seems specifically targeted at geeks, rather than featuring geeky characters who are naturally appealing to geeks. Yeah, I hear what you're saying about The Big Bang Theory. The reason I really like it is because that watching the show is actually kind of like hanging out with my own friends for awhile, and certain elements, like the comic book show, reminds me of my childhood. I especially love the debates they have (such as how Superman would clean his uniform, or which Robin should take over for Batman if he dies or retires) because these are the kinds of debates I have totally gotten into with my friends. :D So it's also pretty nostalgic for me. Here are the articles I mentioned. The one about why geeks hate The Big Bang Theory has some valid points, but also some not so valid ones (e.g. number eight, "messed up references" -- reductio ad absurdum *is* a logical fallacy because it results in a false dichotomy). And reasons why geeks love The Big Bang Theory. APN: Hmm...the links aren't working. Shouldn't there be a .html or something at the end? Ah, now it's working! UGO must have been down when I checked before. It's interesting--the pros seem to all be "I like this show," while the cons seems to be "there is an objectively identifiable issue with this show."